Trust Ebbs in the U.S. There is a lot of money to be made from distrust. I had a very odd experience on Saturday, and when I opened the newspaper on Sunday, a related article caught my eye. It was one of those coincidences that inspire a new post. But on with the story. Saturday was warm and sunny, the streets puddled here and there from melting snow. I went out on a small errand, but the store was so mobbed that I left after a quick and futile search. As I drove out of the parking lot, I chose the long route home, planning to pick up a couple of things at my favorite grocery store. I was heading east on busy Cerrillos Road when I saw two cars ahead in my lane slow down. A woman in the roadway was waving her hands, presumably warning of an accident. The two cars moved left to avoid her, and she was left standing alone, now waving her hands urgently at me. This is when I moved into the odd zone. I registered several things immediately. She was young and Native American, her expression was intense and determined, and she was heavily pregnant. I put on my blinker, slowed down, and pulled to the right curb. Perhaps my intent was to roll the window down and talk to her, but the next thing I knew, she had opened the car door and sat down in the passenger seat. “I want to go to I-25,” she said. Not wanting to obstruct traffic, I pulled out and drove on. I had been playing one of my favorite Ian Tyson cowboy music CDs, and he was singing a song composed for his little daughter. I turned it down a bit and asked, “Will someone help you there?” thinking that she must have made arrangements to be picked up. She nodded, and I continued on down the road toward the intersection where I would turn right to reach I-25. As I drove, I was very aware of how peculiar the situation was. Nevertheless, I was calm and relaxed. My passenger was silent and completely disinterested in me, totally focused on the road ahead She was wearing a light jacket with dark slacks and a knit top that had revealed a little of her belly as she settled in. There was a faint fragrance about her as though she had “dressed” for something. At one point, she lowered the visor to check her face in the mirror, and I noticed that her skin was broken out a bit. “Will you be all right?” I asked her a little later, and she said she would be. A few blocks farther, I asked where she was going, and she said Colorado. Where in Colorado? “A pueblo,” she responded. I proposed that I pull into a filling station to check the map in my car pocket to make sure about the right exit, but she responded firmly that this was unnecessary. I should drop her off at the turn toward Las Vegas. My passenger was well-spoken, and I had the impression that she was intelligent, endowed at least in the moment with a certain authority. A distance was imposed by the fact that she was Native American. If I had been inclined to meddle, it would have been yet another of countless historical violations for which I have inherited some sense of responsibility, and I knew better than to interfere. When we got to the freeway entrance, I pulled over at the underpass. As I came to a stop, I asked if money would be helpful, and she said yes. I reached into the back seat, got my purse, and had to search for a moment in the bottomless pit for my wallet. “Now that I’ve offered,” I said humorously, “I hope I can find it.” I did, pulled out a $20 bill and handed it to her. She thanked me and got out. The last I saw of her, she was easily climbing the incline to the freeway. As I drove away, I hoped that she would be all right, that a good person would pick her up. I assumed, or perhaps knew, that she wanted urgently to get home. This was one of those experiences when you just have to let go of the usual bearings. Something extraordinary was afoot, and I couldn’t name it. One element was a matter of timing. I had made a series of random decisions that put me on Cerrillos at the specific moment when she needed my help. Later I would realize that she was standing right across the street from the Santa Fe Indian Hospital. I will never know her story, but the few minutes we were together were those of mutual trust. We never looked into each other’s eyes, and there was something about her that ensured plenty of space. She was very polite and made no effort whatsoever to solicit more than what I freely offered. I was left with the unusual feeling that what I had done for her was completely sufficient. The encounter was still with me that evening when I met sister Kate and a friend for dinner, and I shared the story. Kate’s friend is an attorney, and his alarmed response was completely reasonable. There are all sorts of reasons why I shouldn’t have done what I did. The moment could have turned into a disaster, but it didn’t. Kate understood completely. Maybe it is a Heath thing or trust in feminine intuition, but we are both known for actions that in retrospect seem to have been protected. Kate commented that my car door should have been locked while I was driving. It clearly wasn’t when I pulled over and the young woman surprised me by opening it and getting in. I checked that safety feature the next morning when I picked up a friend for coffee. The door is locked until I flip a switch, and I didn’t flip it on Saturday. I don’t think I was running the show on Saturday. Now to the Sunday morning paper. There was an Associated Press article about a recent General Social Survey revealing that Americans’ trust in each other is at a record low. Again, this is not about trust in institutions or government, or the church, or Wall Street, but about trust in each other. A record high of nearly two-thirds interviewed are responding that “you can’t be too careful” about other people. Back in 1972, only about half of us felt that way. So what is causing this? A professor quoted in the article suggested that it is due to the growing inequality of income. Some amateur psychologists might say that we’re projecting, that we know we can’t be trusted in some respects, so we assume the same thing about others. Both of these theories sound simplistic. The search for the truth could engage sociologists for years. 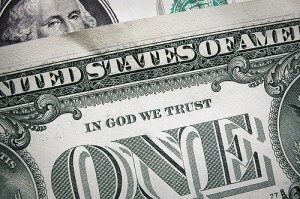 A point they may consider is that there is a lot of money to be made from distrust in this country. Think of all the advertisements promoting various forms of insurance; security systems; apps monitoring this, that, and the other; anti-theft-devices; auto safety devices (like my door); identity monitoring services; and, of course, firearms. How could our sense of trust not be damaged by the commercial din about threats? As we go forward, however, the technology that is distancing us from each other may aggravate the problem. If we relate more to screens than other humans, how can we preserve those ancient observational skills that enable us to read each other’s personalities? Will the new brain we are reportedly developing also impair the intuition that has long informed humans about what is technically unknowable? In his book Blink, Malcolm Gladwell refers to intuition as the “adaptive unconscious.” He writes that “The only way that human beings could ever have survived as a species for as long as we have is that we’ve developed another kind of decision-making apparatus that’s capable of making very quick judgments based on very little information.” Does the decline of trust in this country have to do in part with the disabling of that apparatus? As I said, it’s a complicated question, and I hadn’t given it much thought before Saturday. The encounter with the Native American reminded me that it can sometimes be more important to react than to think, and that this ability may occasionally serve something larger than the safety of the self. I will long remember that brief drive. It gave me a blog for sure, but it also stands simply as a story. And life is full of them. First thank God that you were safe and there were no adverse impacts of your ride with the stranger on Saturday. As you insightfully said, you were not running the show on Saturday. You are a very kind hearted and generous person so this story does not surprise me. ONce again I’m glad all ended well (for you). Secondly on the topic of trust and the low level Americans may be feeling toward each other, this is a Big concern. As you note, the why’s will long be debated. 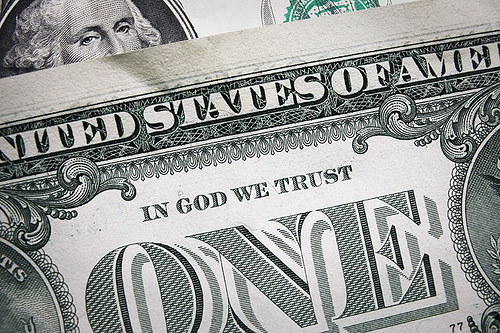 Your image of the dollar bill that shows In God We Trust may also be a major consideration. We have lots much of the Faith we had and from that stem many foundational behaviors and instincts. Thank you for another thought provoking article.